“Spidersong” was my first SFWA-qualifying sale and remains one of my stronger flash stories written to date. It’s been a busy week for this little story. 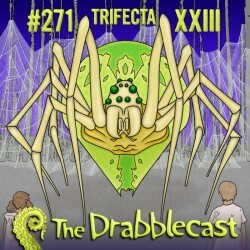 First it was reprinted in the anthology of Campbell Qualified authors (see previous post), and today it’s live at Drabblecast! They do an amazing job, making the story sound awesome and creepy at the same time. It’s also really cool that “Spidersong” got the cover treatment! (It’s one of three flash stories in this week’ s edition). This story was originally submitted to a Cafe Doom horror writing contest. 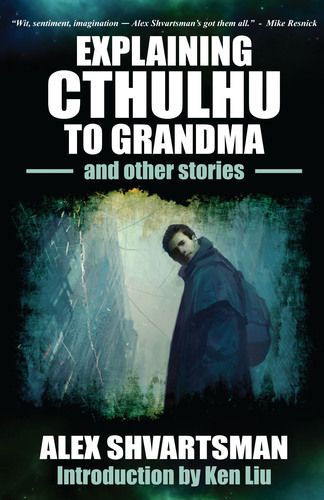 The top prize for this contest was publication at One Buck Horror. Although “A Thousand Cuts” comfortably made it into the top 10 (based on anonymous popular vote by the entrants) among 50 or so entries, it was not ultimately selected as a finalist by OBH editor Christopher Hawkins. But then, a really cool thing happened. Mr. Hawkins was kind enough to offer feedback to any of the top 10 finishers who asked for it. I contacted him and, upon reading the story again, Mr. Hawkins offered some suggestions and invited me to resubmit an updated version to OBH. I was happy to comply. I spent a few days working on the rewrites and ended up with a slightly longer story that followed the same general plot, but was different in tone and feel. I then submitted this new version of the story, and waited. Six weeks later Mr. Hawkins got back to me, letting me know that he did not like the rewrite as much as the original. He felt that the longer version lost the dreamlike quality of the original. However, he was willing to make some edits and send them to me, so I could try again. For those of you who don’t submit stories I must explain that this is a rare thing. Most of the time editors are going to either accept or reject a submission. They rarely have the time to work on the story that’s *almost* there, and a second rewrite request is exceedingly rare. Needless to say, I was thrilled to work with him on the changes. Turned out, the changes he wanted were smaller and more subtle than I was shooting for in my original rewrite. However, they did smooth out and further improve the story! Over the course of a couple of days we had a version we were both happy with. I’m proud to announce the upcoming publication with special thanks to Christopher Hawkins. who believed in the story enough and had the patience to work with me to make this happen.